Biomass heating is not usually associated with steam production. But with the right combination of expertise it is a very successful solution. Boilers for industrial steam applications have been fired on fossil fuels. Biomass is very successful in generating steam for industrial steam applications. Biomass-fired boilers work best in situations where there is a steady load. In a process steam application there are usually peaks and troughs in demand, in this instance an output at a constant level to meet the peaks is engineered to optimise operation. 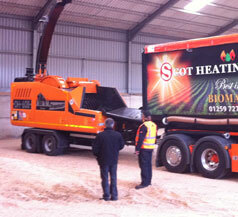 Biomass improves fuel security through diversification. Fuel costs are also reduced and with the continuation of the RHI, the payback period is short. Companies find their carbon footprint can be reduced by up to 95% which helps them meet sustainability targets and enhances their environmental credentials. Cochran has partnered with specialist Scot Heat & Power, a distributor of Kohlbach & Jenforsen Biomass boiler systems as well as being an independent biomass fuel supplier. The right supplier will make or break a project. Scot Heat & Power make a success of every stage, from the design of the installation, to the supply of equipment, fuel supply through to after-market care packages. An example profile of our clients are: Gleneagles Hotel, Queen Margaret’s University Edinburgh, EWOS, Aboyne Academy, The State Hospital Carstairs to name but a few.